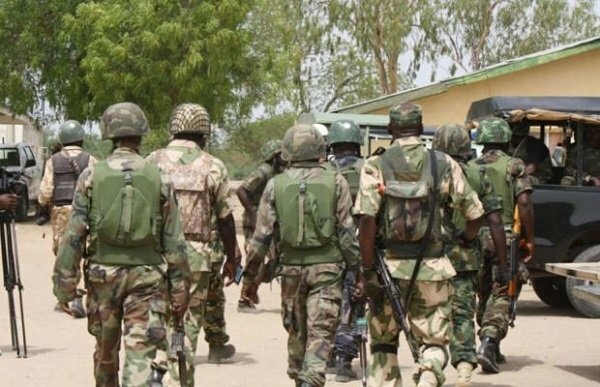 Soldiers have invaded Ogotun-Ekiti, a community in Ekiti South-West local government area over the killing of their colleague on Wednesday by gunmen suspected to be armed robbers. The residents were gripped with fear when scores of soldiers invaded the community forcing many to flee the area while others who are afraid of fleeing stayed indoor. According to the residents, the soldiers now patrol the area in twelve Toyota Hilux vans. Narrating their ordeal, the community leader, Paul Awopetu, who confirmed the development to our reporter on Thursday, said a resident was killed by suspected robbers at Olori Oko farmstead in Ogotun. Awopetu disclosed that one person who escaped from the robbery scene reported the incident to soldiers manning a checkpoint between Ogotun and neighbouring Igbara Odo. “Two soldiers followed the person who escaped from the farmstead but the robbers killed one of the soldiers. “The soldiers are combing the bush, forest and surrounding farmsteads in search of the robbers who killed their colleague,” he said. Police spokesman in the state, Caleb Ikechukwu, confirmed the incident. “The incident has come to my notice; I have been duly informed about the soldier killed by unidentified gunmen. That is the information at my disposal for now,” he said.